London, Dec 09 - Polish tennis star Agnieszka Radwanska has named tennis legend Martina Navratilova as her new coach, which would be the former world number one's first major coaching role. The 18-time Grand Slam singles-winner, who would link up with the world number six at the end of the year, said that she cannot wait to get started on this new phase of her career and she is really excited. Navratilova will work with Radwanska's full-time coach Tomasz Wiktorowski, and will train with the Pole for the first time in Miami after Christmas , The BBC reported. Washington, Aug 16 : Fourth-seeded Agnieszka Radwanska, who reached the quarterfinal at the Cincinnati Masters, withdrew from the tournament to attend the funeral of her grandfather in Poland. "Unfortunately, my granddad passed away last Sunday, the funeral is Saturday and I need to be there," Radwanska said, reports Xinhua. "I'm disappointed not to continue with the tournament, especially due to my form this week." She was scheduled to meet Chinese player Li Na at the quarterfinals Saturday. Li now advances directly to the semifinals. 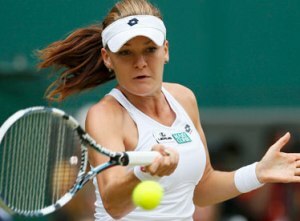 Melbourne, Jan 18 : Fourth-seeded Angieszka Radwanska won her 12th match in a row and reached the fourth round of the women's singles at the Australian Open here Friday with a 6-3, 6-1 victory over Britain's Heather Waston. Radwanska received treatment for what appeared to be a blister on the small finger of her right hand in the second set but she managed to overcome the injury to seal an easy win, reports Xinhua.